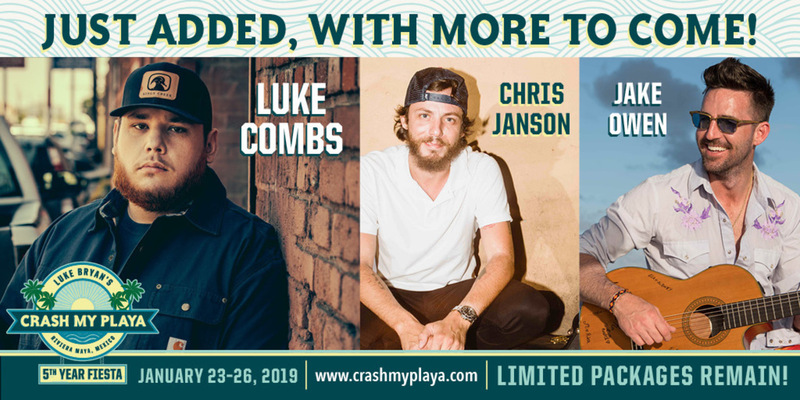 NASHVILLE – November 19, 2018 – Luke Bryan’s Crash My Playa – 5th Year Fiesta has added Luke Combs, who will headline one night, Chris Janson and Jake Owen as performers for the destination event taking place January 23-26, 2019 in Riviera Maya, Mexico. They join Luke Bryan who will headline two of the four nights and previously announced headliner Thomas Rhett along with Dustin Lynch and Lauren Alaina. Additional performers still to be announced. The event’s host resort, the Barceló Maya, is sold-out with limited packages remaining at one of three other carefully selected tropical resorts. At all locations fans will enjoy royal treatment all weekend long including all-inclusive food and drink, 24-hour concierge service, convenient nightly shuttle transportation to the main stage performances, daily onsite activities, offsite adventures like visiting Chichen Itza, zip-lining, and ATV tours, excursions including day trips to Tulum, official Crash My Playa – 5th Year Fiesta merchandise packages, and more. To see highlights from last year’s event go HERE. CMA Award-winning Luke Combs is a multi-platinum, No. 1 Country singer-songwriter from Asheville, NC. With brazen songwriting talent and grizzled, soul-infused vocals, Combs stormed onto the music landscape as one of Country’s brightest stars with the release of his critically-acclaimed, RIAA Platinum, No. 1 debut album, This One’s For You on River House Artists/Columbia Nashville. Celebrated for its lyrical fortitude and modern traditionalist bravado, the project and its expanded deluxe version have spurred four consecutive No. 1 hits: “Hurricane,” “When It Rains It Pours,” “One Number Away” and “She Got The Best Of Me.” Combs is the first solo artist to score four consecutive career-opening No. 1’s on Billboard’s Country Airplay chart. Recently awarded New Artist of the Year at the 52nd Annual CMA Awards, Combs will embark on his largest North American headline tour in 2019—with 27 of the 28 venues already sold-out. The “Beer Never Broke My Heart Tour” features sold-out performances at Greensboro, NC’s Greensboro Coliseum, Greenville, SC’s Bon Secours Wellness Arena, Columbus, OH’s Schottenstein Center, Charlottesville, VA’s John Paul Jones Arena, New York’s Hammerstein Ballroom, Omaha, NE’s HI Health Center and Morrison, CO’s Red Rocks Amphitheatre among many others. Janson is a 3-time CMA nominee, platinum-selling, high-octane entertainer, multi-instrumentalist, award-winning singer/songwriter, and the youngest living member of the Grand Ole Opry. His sophomore album, Everybody, produced his second No. 1 hit single, “Fix A Drink,” the chart-topping follow up to his No. 1 debut smash and summer anthem, “Buy Me A Boat.” His latest single, “Drunk Girl,” was a Top 5 award winning song that took “Song of the Year” at the MusicRow awards. His many acknowledgements include the recent CMA award nominations that included Best New Artist, Song of the Year and Video of the year for “Drunk Girl,” a song written from a father’s perspective which is receiving a lot of praise from his fans. Janson closed out the 53rd ACM Awards with what Rolling Stone called a “must-see performance,” and he floored his audience at Stagecoach. Janson is currently on the “Life’s Whatcha Make It Tour” with Jake Owen, as well as doing his own headlining dates, which included a sold-out show at the historic Ryman Auditorium.